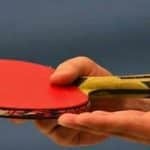 Now that you have finally decided to join us in the awesome table tennis world, looking for the best table tennis is a great way to start. There are different types of tables out there, and choosing the right one is complicated. But there is no reason to fear. 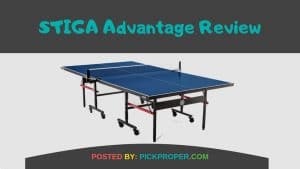 We are here to help you decide which one is the best option, and we will do that by talking about one of the best table tennis table currently in the market. During our STIGA Advantage review, we will analyze why this product is a worthy acquisition for everyone. 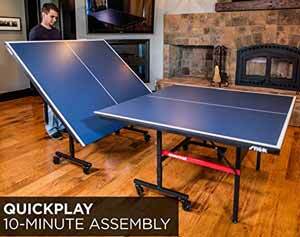 Whether you use it at a friend’s house, during a lunch break at the office or on a trip, this is a versatile table that will host your games, and it will provide plenty of good memories with your friends. Let’s take a look at everything this table has to offer. In the market, there are barely any tennis tables as satisfying as this model. Every time you consider buying a new table, one of the main concerns is whether or not you will get an item worth its value. Sometimes they are, and they provide many advantages that make their disadvantages go unnoticed. In other occasions, however, it is too bad to ignore. The STIGA Advantage seeks to erase all of these concerns. You can confirm the table’s efficiency from the moment you get your hands on it. It is a very easy table to install, requiring barely any technical knowledge at all. However, in order to avoid unpleasant accidents, make sure you have another person available to help you out during its installation. The table comes 95% preassembled, but it is still quite heavy. Leaving that aside, the table is quite user-friendly. It has a quick set up, the net and other pieces are easy to attach or remove, which makes it great in case you need to move it around. The option to fold it and move it freely is also another plus from this product. You can basically put it anywhere you want to practice the sport. In case you want to store it, you can do that as well by putting it in the storage position. In general, this is a product that meets the expectations successfully. 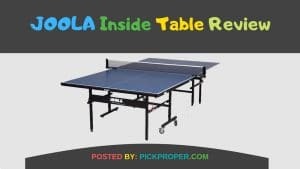 If you are looking for a great tennis table, then this is a clear option you should consider. Let’s take a look at a few of the most important benefits we can expect from purchasing this product. The benefits of this table are visible right out of the box. It comes with 95% of its pieces preassembled from the get-go, which means it does not require too much effort to install it. Even the most inexperienced players will have the opportunity to get this table and set it up quickly. Thanks to its QuickPlay design, the installation process removes unpleasant experiences and offers more fun every time you install it. Every player will have the opportunity to use this table under different applications. First, it works great as a normal table in a play position, but you can also set it up in a playback position to practice your skills in a single game. Additionally, it also features a storage position. In this position, the table consumes less space, and it allows you to place it basically anywhere around the house. Whether it is in your house, a school, at work or in a more competitive stage, this table is suitable to use it in different environments. The easy to install process, as well as the storage position, allows you to move it and set it up in any scenario you want. 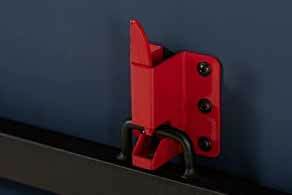 A great benefit this table offers is its latch system that provides better safety measures. It features a spring on the table’s underside that locks the table effectively. Through this system, the table maintains its upright position, and it will not suffer uncomfortable movements unexpectedly. As a final note, we will take notice on the table’s price. It is an accessible tennis table that provides what you require and need. More often than not, it is extremely disappointing when we pay more for what we assume are quality tables, but in the end, they are not. In this case, however, it delivers what it promises at a reasonable price. Unfortunately, there is an issue we found while using this table, and that issue has to do with its quality. Don’t get me wrong, the table does offer an ideal performance for every type of player, but it lacks when it comes to its durability. You have to handle it carefully when you are setting it up. When you get it out of the box, the most recommendable thing to do is to get assistance from a second person. While it might not seem like it, the table’s weight could surprise you. Dropping it will definitely damage the table quite easily. But we’re not going to delve into this. It is an issue that mostly presents if you put the table under rough circumstances, which is not always the case. If you have a certain area where you will put the table at, then you don’t have to worry about this issue. Keeping it at one place prevents it from suffering any damages caused when you are moving it, disassembling it, or setting it up. Other than that, there are no more issues with this product. 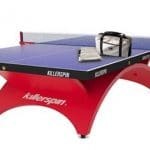 It is an effective table that will host fun and interesting matches for you, your family or anyone who plays on it. Now that we have analyzed the different elements that this product includes, it is certainly a good moment to consider if it is what you are looking to buy. 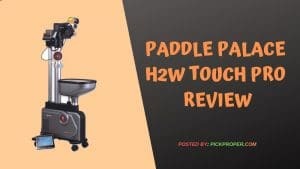 Undoubtedly, there are options available with less price value, or with higher quality out there, but when it comes to a product worth its price, this table is certainly a suitable choice for everyone. It features what a good table should have. This table also meets many of the expectations you could demand from this type of product, all of this by offering you a product capable of working effectively. Our STIGA Advantage review had the purpose of giving you all the information you could need. Now, it is your turn to make the decision about what table you want to buy. Make sure you choose wisely. In the end, a good table is a big element that enhances your experience, making you want to play over and over again.